About 10,000 people attend a rally in Rangoon celebrating the passage of four controversial laws proposed by Buddhist nationalists and endorsed by President Thein Sein. RANGOON — Thousands gathered on a sweltering Sunday in Rangoon, fanning off sweat as they listened intently to some of Burma’s most renowned Buddhist monks expound on the import of protecting the nation’s dominant faith. The Association for the Protection of Race and Religion, known locally by the Burmese acronym Ma Ba Tha, conjured more than 10,000 supporters to Thuwunna National Stadium 1, an indoor venue in the former capital, for several hours of reflection on a quartet of controversial laws viewed by many as discriminatory toward women and religious minorities, particularly Muslims. The so-called “protection of race and religion laws,” first proposed by Ma Ba Tha and swiftly pushed through the legislature, create restrictions on interfaith marriage, birth spacing, polygamy and conversion. Sunday’s event, which drew supporters from as far afield as Shan and Karenni states, marked the end of a nationwide tour celebrating the “triumph” of the movement’s successful lobby for the laws. One of the group’s central figures, U Tiloka Bhivumsa, inaugurated the ceremony by acknowledging the support of President Thein Sein in bringing the bills to a parliamentary drafting committee. Once drafted, they passed easily through the legislature before other items such as new mining and investment measures. The 77-year-old monk told the audience that he personally solicited the help of the president on the matter after the group had secured some five million signatures in support of the bills. Thein Sein then assured him that he would “do what he can” to bring about the measures. The president ordered a new commission to hotfoot the bills in March of last year, and by December they had already reached the parliament floor. The first, and some would say most controversial, was signed into law in May—the Population Control Healthcare Law. The remainder cleared both houses during the final legislative session before a Nov. 8 general election, which could rebalance power to some degree. Sitagu Sayadaw, an influential Buddhist monk, addresses Ma Ba Tha supporters in Rangoon on Oct. 4, 2015. The timing of the celebrations—which began in various parts of the country just a week after the start of the official campaign season—were purely coincidental, Ma Ba Tha has said, though the rallies have invariably drawn large crowds of supporters and are said to have been infused with partisan messaging. Last week, U Wirathu, a central figure of Ma Ba Tha’s nationalist movement, said the events were planned only in response to the passage of laws and had no political motive. “We didn’t do it intentionally,” he professed in a video shared with his some 100,000 Facebook followers. Sunday’s speakers demonstrated caution in their addresses, conspicuously careful not to make explicitly political remarks. The group has come under fire in recent weeks for what is viewed as an unhealthy reach into partisan politics, thought it refutes claims that it has deliberately tried to sway the electorate. Foreign diplomats have warned against the blurring of lines between religion and politics, and the main opposition party, Aung San Suu Kyi’s National League for Democracy (NLD), has accused the group of enabling the dissemination of materials that favor the ruling Union Solidarity and Development Party (USDP). Emphasizing that the laws did not target any particular person, race or religion, Tiloka Bhivumsa said the laws were purely intended to ease religious conflict instead of to incite it. “What I can boldly guarantee is that if [these laws are] abided by all, there will be lesser conflicts based on race and religion,” he said. Ma Ba Tha has deflected responsibility for some regional chapters following accusations that the Ma Ba Tha logo had been appropriated on materials that gave the public the wrong impression of the movement, and on Sunday also issued a statement explicitly banning the use of its logo in association with any political activities that could “defame” the group. Over the past few years, Ma Ba Tha has earned a reputation as an anti-Muslim lobby, an accusation that many of its members will openly state while others claim only to be “protecting” Buddhism. Anti-Muslim sentiment has flared in the predominantly Buddhist country, escalating after a rash of deadly riots between Buddhists and stateless Rohingya Muslims that began in 2012. The group, which lives mostly in western Burma’s Arakan State, is denied citizenship and referred to by the government as “Bengali,” a term implying that they are illegal immigrants from neighboring Bangladesh. While some among Ma Ba Tha’s leadership have publicly stated their intention to prevent the spread of Islam, their public rhetoric has become markedly more indirect of late. 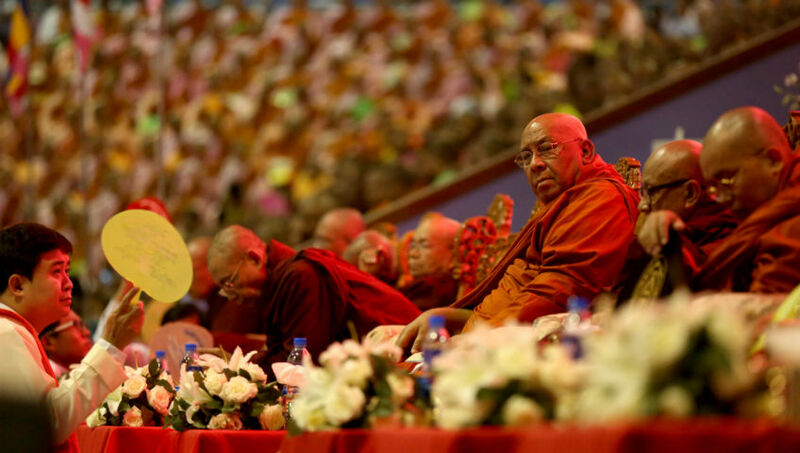 Sitagu Sayadaw, another widely influential monk who spoke at Sunday’s event, admonished the overt intervention of religion in politics, saying that some monks had gone “too far” and urged his followers to “avoid extremes” by favoring some people or policies and pressuring others. The monk, labeled abroad as a “firebrand,” went on to outline plans to introduce measures that would prohibit ritual cattle slaughter during the Muslim holiday Eid, as well as campaigning against headscarves worn by Muslim women. Wirathu postulated that the traditional attire could be used to disguise terrorists. Top Photo - (Hein Htet / The Irrawaddy ) About 10,000 monks, nuns and laypeople gathered at a Rangoon stadium for a Ma Ba Tha rally on Oct. 4, 2015.